pianist. She surrounds herself with some fine musicians including guitarist Noel Borthwick, to bring us a set of new music which pushes the boundaries both harmonically and rhythmically. The result is a fresh and creative disc that is not for the faint of heart. One of the captivating things about Ramona’s music is she is so influenced by world rhythms, and she is able to incorporate these rhythmic ideas into her landscaped compositions. Her tunes convey contrast, and they seem to have a story-like quality to them. This is jazz music that reflects world ideals and these ideals are translated in a variety of ways to give the listener contrasting viewpoints. 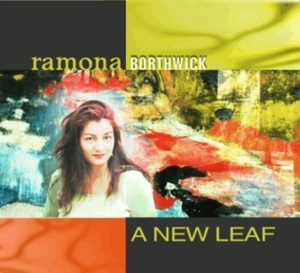 Ramona is joined by Noel Borthwick, a fine guitarist, who is a proclaimed self-taught musician. However, Noel spent a year of private study with acclaimed Indian sarod player Shekhar Borkar. His primary concentration happened in his late teens. He began to develop a strong interest in bebop, modal and mainstream jazz styles, and was inspired by guitarists such as Pat Martino, Joe Pass, Jack Wilkins and the music of John Coltrane. Noel brings a genuine sense of joy to this project, and is a fine compliment to Ramona and her group. polyrhythms which give this music a fresh and distinct sound. Let me share some of the interesting contrasts to this recording. First of all, when you listen to her compositions, they reflect global priorities. From the† Argentine ‘chacarera’ rhythm in Garbarero. Then to Latin Quarter, which is a reflection of street life in Montreal’s latin quarter, to Baarah Sur, which translates 12 tones in Hindi, and then you’ll hear the Brazilian influenced composition Lotus Lake. Ramona is capturing an ideal of improvisational music that incorporates a variety of cross-cultural exchange. The musicians are up to the task on this recording. The music is at times difficult and challenging, but the improvisations seem ever flowing and seamless. They’re comfortable playing over a variety of rhythmic feels, and they embrace the harmonic challenges given to them. Noel’s playing captures so much of the ideals of Ramona’s phrases. And he adds so many cross rhythms and punches to accurate harmonic layouts. Phil Grenadier, trumpet, has a warm rich sound on this recording, almost as if he’s playing flugelhorn. He will remind many of Kenny Wheeler in the way he uses color and expanded range. Overall, Ramona has debuted a fine recording that conveys a perspective of world culture. The disc has fine performances throughout. The compositions are interesting, but will take reflection and understanding to appreciate them fully. This is a great recording and I hope many get a chance to hear it and buy it!